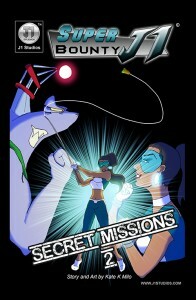 The first couple pages of Super Bounty J1: Secret Missions 2!! Story and art by Kate K Milo! It was a long winter for all of us, but everyone’s favorite bounty hunter has been hard at work, capturing those nefarious villains that plague DNA city. In this newest installment of Super Bounty J1: Secret Missions, J1 and her cohorts are tracking down Jammerhead, a genetic science experiment combining Hammerhead Shark DNA with a body-building beach bum. He has escaped from the laboratory that created him, and while we at J1 don’t condone animal testing, we do condone keeping bad guys away from the populous. Follow the adventure of J1, Master Chin, & the Panditos in this newest Secret Mission! Click HERE to read the next page OR just click on COMICS and find it that way.